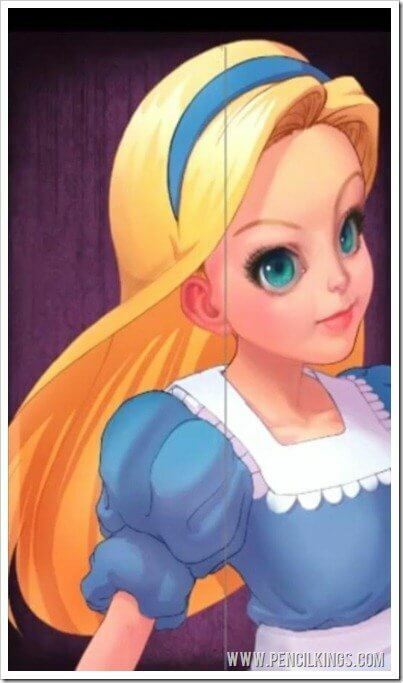 In the previous lessons on coloring fantasy art in Photoshop, we’ve been working on Alice’s features, creating layer upon layer of subtle blends to achieve an amazingly realisitic effect. Now these features are all done, we’re almost ready to start work on the hair. But, before we do that, let’s take a look at how you can edit the background and make it work better in your painting. Choosing the right background for your painting is essential, as this will enhance the main image and bring everything together nicely. Here, we already have the background we want to use, but the gray color’s not quite right. So, to fix this, go to your background layer and hit Ctrl + U to bring up your Hue and Saturation palette. From here, you can now experiment with some colors until you find the one that works best. Remember to keep clicking the preview on and off so you can see how your changes will look before you apply them. You’ll notice how Sycra goes through a whole range of colors before settling on a purple for his background. You can always adjust the color later if you decide it’s still not quite right. You can also experiment with adding another background layer to give added visual interest. Here, Sycra has an image of an old-fashioned frame which he thinks might work. However, having tried this out, he decides to add a gradient to the original background first. To add a gradient to your background, create a new layer, then select the Gradient Tool from your toolbar – it looks like a rectangle with a shaded area at the top. Then, select the Foreground to Transparent option from your top menu bar and draw a line where you want the gradient to appear. Hit Ctrl + U to bring up your Hue and Saturation palette, where you can adjust the color of this new gradient layer. You can also experiment with adjusting the color of the background layer itself and seeing how this looks with the gradient. Once you’ve got the right balance, merge the gradient layer with the background layer – remember you can still alter the color if you want. Take time to experiment and try different colors – doing this can really add an extra dimension to your painting. Once he’s got his background looking good, Sycra decides to bring back the image of the old-fashioned frame from earlier and experiments with different layer modes in the Layers palette to achieve the look he wants. When coloring fantasy art in Photoshop, keep trying out different modes and colors until you find the one that works best for you. There are no rules here – it’s all about personal preference and what will work best in your painting. 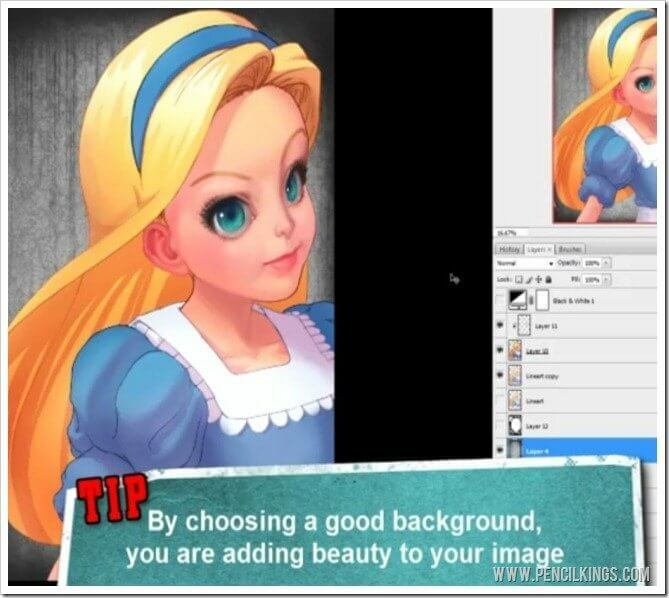 Remember that your background shouldn’t detract from the main character in your painting. Getting the balance right is something you’ll learn thru experimentation! Once you’re happy with how the background layers are looking, merge them down and let’s get started on Alice’s hair! Now the background layer is done, you’re ready to move on to the hair. Remember how we worked on the eyebrows to get them looking realistic? That’s the kind of look we want to be aiming for with the hair too. 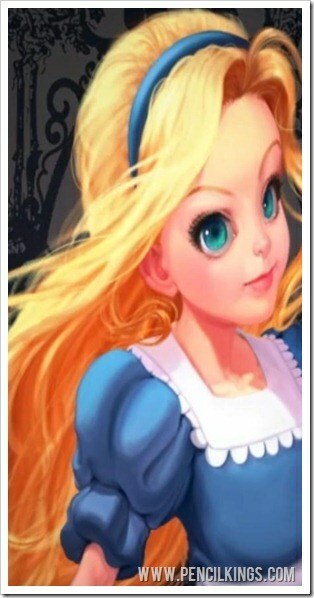 So, to achieve this, you’re going to be adding some more blends and layers of color to create Alice’s flowing locks. Sycra decides to work on the bangs first, so to being work on Alice’s hair, create a new layer and hit Alt to make this a Clipping Layer. Then, zoom in on your painting, select a large brush, and start trying to recreate that feeling of softness we managed to get in the eyebrows. First, we need to lose the hard edge where the hair meets the forehead and make this more subtle. To do this, pick up some of the skin color, and then paint into the hairline to soften the lines. After you’ve done this, pick up some of the hair color and blend this back into the skin. Unless your subject is wearing a wig, the hairline should always be blended! Pressing the Alt key while working with your brush will change the tool to the Eyedropper Tool, allowing you to mix and change colors on the fly while coloring fantasy art in Photoshop. Taking one of the darker colors in the hair, keep drawing over the lines so they eventually disappear. 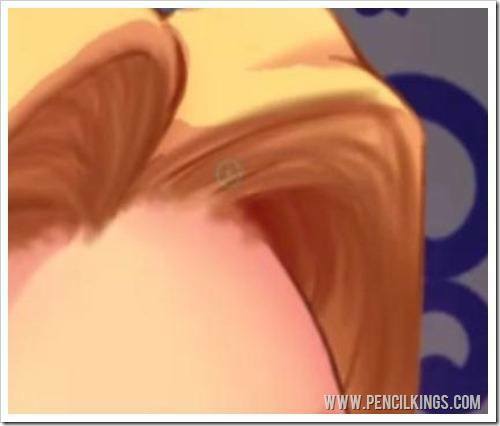 We still want to give an impression of how the hair flows though, so by drawing these lines back in using a soft brush, you’ll achieve a realistic hair texture that really completes the face. Use large, loose brush strokes when adding texture to the hair – this will help you achieve the look you want. Once you’ve finished the bangs on one side, go and repeat the process on the other. Keep turning your new layer on and off to see how your changes are looking. 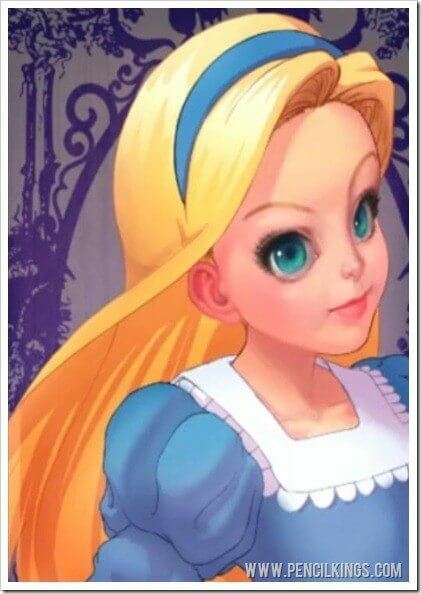 The bang on the right-hand side of Alice’s head would be quite shaded, so taking a large brush, build up some areas of shadow by picking up colors from the hair and then darkening them accordingly. Just keep going until you’ve achieved the right effect. Getting the hair looking realistic takes some time, so in the next lesson, you’ll be seeing how Sycra continues to blend colors and draw in the flow of the hair before moving on to start work on Alice’s clothing. We hope you’ve found this lesson on coloring fantasy art in Photoshop useful. Remember, because you’re learning from a professional such as Sycra Yasin, you’ve now got some of the skills which are in hot demand worldwide!